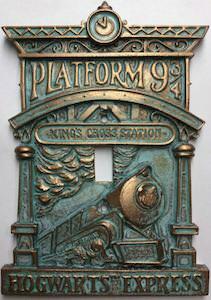 If you want to decorate your home Harry Potter style then do so with this Hogwarts Express Light Switch Cover. We all know that light switch covers are boring and plain but now you can change them out with this Harry Potter cover plate. The Harry Potter light switch cover has a green and coper looks and on it you can see the train that brings them to Hogwarts as it is riding into Kings Cross station where the kids can enter the train from platform 9 3/4 and all that can also be founded in text on the cover and on top of it all it even shows a clock. Changing a switch plate is easy and anyone that knows how a screwdriver works can do it so time to add some Harry Potter to your lights.